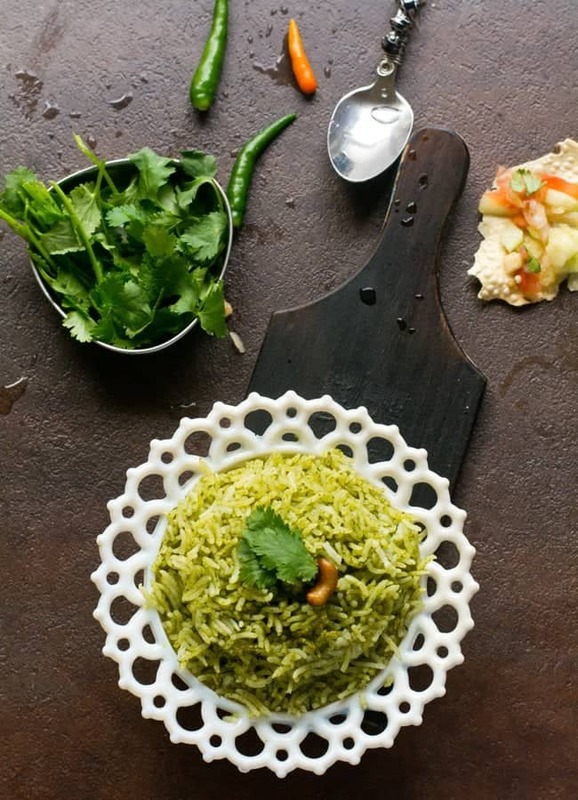 Kothamalli Sadam / coriander rice is super easy and very healthy, with step by step pictures and instructions. Its a very flavorful, one pot dish. 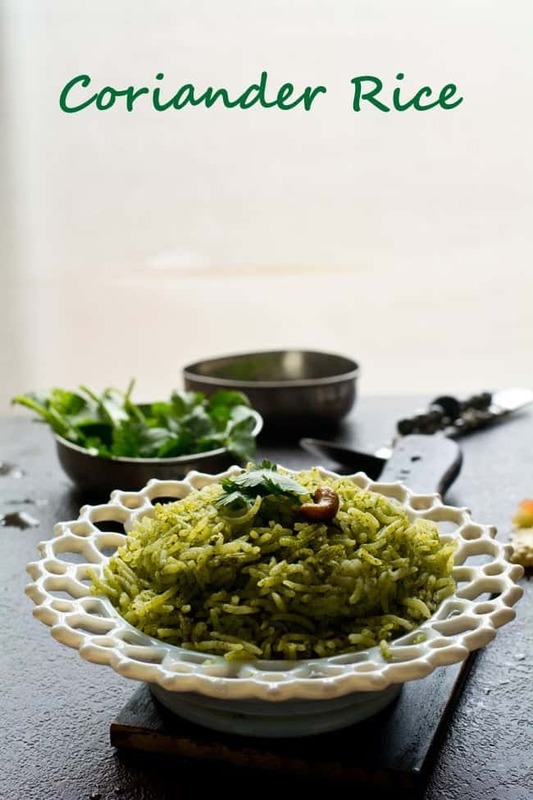 The luscious green color of this Indian style cilantro rice, tempts everyone. Simple raitha and papad are the best companions of this rice. This recipe is the must try one when the coriander leaves are in season. Another good part of this recipe is that it does not require long listing ingredients like Kashmiri pulao. The flavors of simple spices and with the exotic flavor of the basmati rice, kothamalli sadam tastes extremely well. If you are looking for other rice varieties, you may check Szechuan Fried Rice, Simple Chitranna, Bok Choy Fried Rice. I have explained by using my wonderful heavy bottomed pot. But if you want you can also use your regular pressure cooker for making this rice. Discard, thick stalk of the coriander leaves, Its ok to add tender stalks which is also good for health, because of its fiber content. Adjust the green chilies according to your taste, and also according to the intensity of the chilies. Fried papad and raitha can be served as side dishes. 1. Soak 1 cup of basmati rice in water for about 19-20 minutes. 2. Wash and clean one bunch of coriander leaves, two green chilies. Peel 2 garlic cloves and keep them ready. 3. In the mixer grinder jar, add all these three ingredients. 5. In medium to slow flame heat heavy bottomed pot over the stove. Add 2 tbsp of cooking oil and 1 tbsp of ghee. Then add small piece of bay leaf, 1 green cardamom, 1 clove and 1 small cinnamon stick. Fry them until it becomes golden brown in color. 6. Now add 2-3 tbsp of broken cashew nuts and fry them until they turn golden brown in color. 7. Now add kept aside coriander paste mixture. And continue to saute them until it shrinks and leaves out its raw smell. 9. Add 1 Cup of milk, and bring it to boil. 10. When water is about to start boiling, add washed and rinsed 1 Cup of basmati rice. 11. Once 80% of the rice cooked(Hint: 20% of the water would be remaining in the pot), drizzle half a tbsp of ghee over the kothamalli sadam. 12. And seal it with aluminium foil. And keep tawa/iron pan in between the pot and the stove. And cook it for 10 minutes in simmer flame.This is the simple and easy process of dum method. 13. Let the pot cools down, remove the foil and serve kothamalli sadam hot with raitha, potato curry. 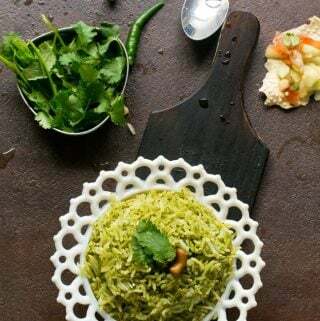 Coriander Rice / kothamalli sadam is super easy and very healthy, with step by step pictures and instructions. Its a very flavorful, one pot dish. Soak basmati rice in water for about 19-20 minutes. Wash and clean one bunch of coriander leaves, two green chilies. Peel garlic pods and keep these things ready. In medium to slow flame heat heavy bottomed pot over the stove. Add 2 tbsp of cooking oil and 1 tbsp of ghee. Then add small piece of bay leaf, green cardamom, clove and small cinnamon stick. Fry them until it becomes golden brown in color. Now add the broken cashew nuts and fry them until they turn golden brown in color. Now add kept aside coriander paste mixture. And continue to saute them until it shrinks and leaves out its raw smell. Add 1 Cup of milk, and bring it to boil. When water is about to start boiling, add washed and rinsed basmati rice. Once 80% of the rice cooked, drizzle half a tbsp of ghee over the rice and seal it with aluminium foil. Keep tawa/iron pan in between the pot and the stove. And cook it for 10 minutes in simmer flame. 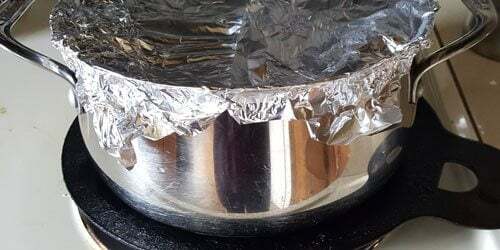 Let the pot cools down, remove the foil and serve kothamalli sadam hot with raitha, potato curry. For a slight variation, try adding a couple of sprig of mint leaves. Which does enhances the flavor and kothamalli sadam does tastes absolutely different and delicious. Adding chopped ginger in the initial stage of frying, would also good for digestion and a unique flavor. Wash and rinse the rice before soaking, this ensures the flavor intact with the rice. Easy and simple method of dum process is discussed here. There are multiple other methods are also available and I personally find this is more easier and convenient method. If you are planning to make in pressure cooker, just replace heavy bottomed pot with pressure cooker. Close lid with the weight, only at the stage of 80% done or at the Step 10. I have added a little cashew nuts, but more cashew nuts and almonds can also be added, which also yields a very rich kothamalli sadam /rice. Serve along with raitha, or a Cauliflower golden fry. Serve hot, the left over can be refrigerator in a air tight container, it stays good for about 4-5 days. This is a lunch recipe, and in occasions can be served for dinner as well. Liked this recipe, follow us on Facebook, Pinterest, Instagram. Thanks for the great rice recipe. I have the coriander and green chilies growing in my garden right now, so I’ll give this a try in a few weeks! Sure and That’s great to hear! home grown always healthy and tasty as well.